If you’ve got a leaking school roof, or if you’re at all concerned about the condition of your school roof, getting a comprehensive school roof survey will help you understand the true situation, put your mind at rest and help you plan for funding applications. A condition survey will provide the evidence required to make your CIF application successful, and with the right advice will help avoid unnecessary repairs or costly damage to your buildings, their contents, staff and pupils. SIG Design and Technology are independent specialists in flat roofing, so we’re ideally suited to carry out a survey for you, and what is more our survey is FREE. Find out more in this article. How do you carry out the Free School Roof Survey? Firstly, we will make a no-obligation pre-inspection of your school roofs, to determine any issues on your roof, or indeed if any work is required. All surveys are undertaken with minimal disruption to the school day. Then we meet with you and discuss our findings, and if we are confident that a comprehensive survey is necessary, the roof survey is carried out. The survey inspection is made by experienced Technical Managers from our team, who attend the school and survey the building externally and internally. All our inspectors are DBS (Data Background Search) checked and experienced at working in a school environment. Risk Assessments are carried out and the inspection is carried out in accordance with best practice with health and safety at the fore. The Technical Manager will then prepare a Condition Report collating all the survey findings and recommendations, which we will discuss with you in detail. What Information is Provided in the Condition Report? 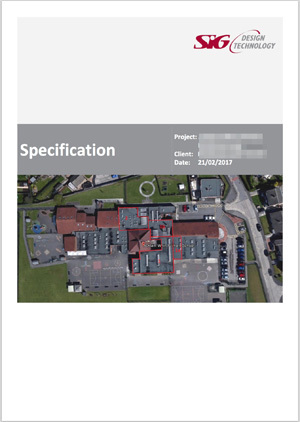 A general overview of the school’s roofs describing their pitch, type of falls, type of existing finish and the existing waterproofing system, insulation, vapour control and drainage systems. We will identify what repairs have been made to the roofs and the materials used; this is important to help determine how the construction is performing, why it might have failed and the most appropriate means of repair or replacement. We will evaluate how the water is leaving the roof including all gutters, and look at cladding, roof lights, upstands and parapets. These are all areas where a lack of maintenance or damage can dramatically shorten the life of your roof. We will also check for roof mounted plant, including air handling units and Photovoltaic or Solar Panels to see if their installation has had an effect on the roof. On each roof we inspect, we will take core samples, where a small section of the roof is removed to determine the build-up and check the condition of all the roof elements down to and including the deck which supports the roofing materials. During the core sample exercise we can also check for moisture content in the different layers. Sample cores are replaced and the area repaired. 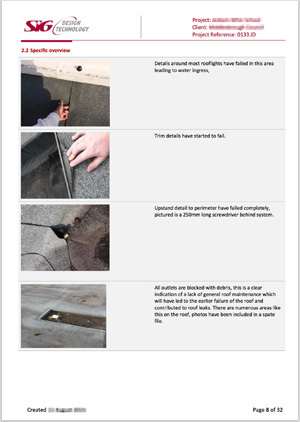 We will take a photographic record of our findings, which we can use to show you the condition of the roof and brief the contractor on what to look out for when work is carried out. As part of our condition report we will advise on the life expectancy of all the existing roof coverings, make recommendations as to the actions required to extend the serviceable life of the roof coverings, and form a strategic plan to look at a programme into the future for renewing the roofs as required. Initial Costings for the Works. Our comprehensive roof survey and recommendations can then be used to inform a funding application to the Condition Improvement Fund, to instruct accredited contractors and to act as the Specification to which they will work. If your school is part of a Multi Academy Trust, condition surveys of this type can be used to inform an estates management strategy for you. We can work with our team of expert surveyors to manage planned maintenance and repairs on the whole estate, bringing peace of mind and savings on unnecessary repairs. 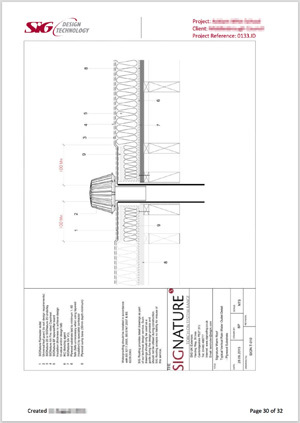 SIG Design and Technology is not a manufacturer of roofing systems, but an independent company backed up by the FTSE 250 registered logistics company SIG Plc. This makes us “product neutral” with the credibility and expertise to provide independent advice backed up with reliable warranties. Why is the School Roof Survey Free? If we’ve carried out a pre-inspection and are satisfied we can help you, SIG Design & Technology provide our service to schools for free, including our comprehensive roof survey and specification. This is not only because we are confident in ensuring funding for the repairs and/or replacement. It also allows us to manage the roof design process, the on-site process, and the product selection. This means that we can provide our customers with genuine, quality guarantees. We take the risk, so you don’t have to. A comprehensive condition survey is a first starting point to help you manage the school property with confidence. It will provide you with the information to plan maintenance and ongoing maintenance to ensure your roofs perform well for years to come.